Glo Germ™ is a product sold both in liquid and powder form that contains proven safe ingredients formulated to be the same size as bacteria, basically 5 microns in size. When used in either the powder or liquid-based form, with the use of an ultra-violet light, it simulates the spread of germs, teaching how quickly and broadly germs can be spread in a short period of time. Glo Germ was invented in 1968 by Dean Luxton, then of Costa Mesa, California. 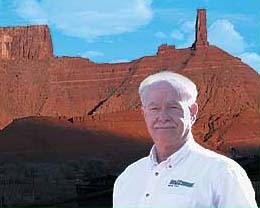 In 1972 Luxton moved to Castle Valley, Utah and in 1975 DMA International, of which Joe Kingsley is president, acquired the rights to Glo Germ. In the 1980's a market was developed in Canada with 60% of Glo Germ's product being exported to that country. The market at that point was 100% medical. Now, it is 25% educational, 25% medical, and 50% industrial (restaurants and consumer based industries) and is spread across the globe. Glo Germ is sold all over the world with primary international markets being Canada, Australia, Saudi Arabia, Bangladesh, Malta, New Zealand and many European countries. Major food chain companies such as McDonalds, Burger King, Arby's and Marriott Hotels Airline Catering all use Glo Germ to inspect and train regional managers and employees in proper food handling. For several years Glo Germ has been providing materials for preschool and day care facilities to train providers and the children in proper handwashing procedures. Glo Germ provides the children with a visible understanding of what germs could look like.